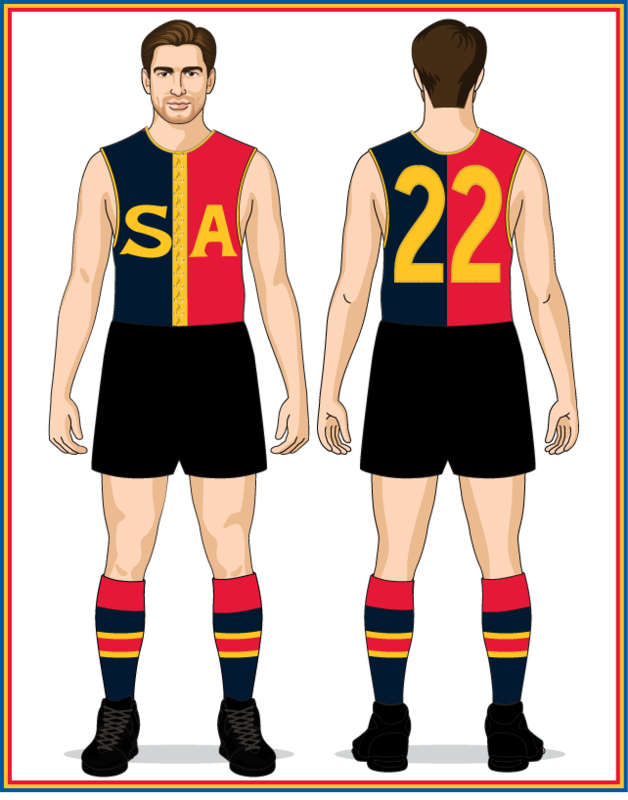 By mid-1929 a renewed push for all South Australian sports to adopt a uniform set of representative colours was underway. 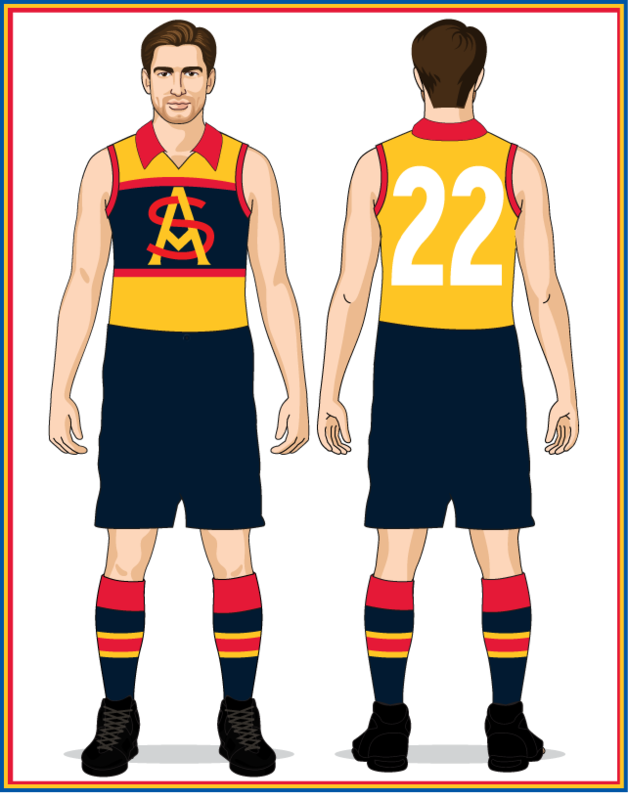 The first effort in 1907-08 had seen most sports trial the chocolate brown and turquoise blue but by 1929 only Australian football and hockey had persisted with this colour scheme and the State cricket team had steadfastly refused to give up their use of red, black and yellow. The front cover of the Register News-Pictorial [10-7-1930] featured a photo of SANFL Secretary, Frank Marlow unveiling a prototype of the new South Australian jumper to be worn at the 1930 National Carnival (it was this design that Adelaide Football Club used as the source for their 2005 Heritage Round jumper). New socks were introduced as well and, unlike the jumper, the design was long-lasting; surviving until 1946. The general consensus after the 1930 Carnival was that the new colours were a good choice but the design of the jumper itself still needed work. 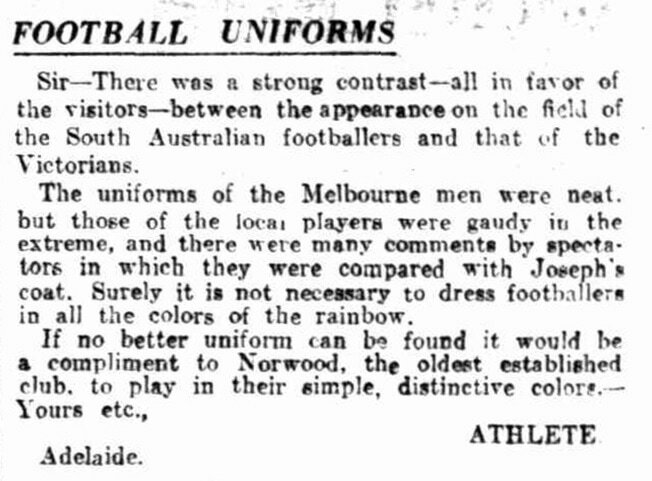 A correspondent in the Advertiser and Register [19-6-1931, p.6] noted: "The best method to adopt in selecting a uniform is to aim at simplicity of design, distinctiveness--something that will contrast with the uniforms of the other State teams--and neatness." On that criteria the 1931 design certainly passed the test for distinctiveness, but in regards to simplicity of design... not so much. As with so many South Australian jumpers of this era the designers went overboard, on this occasion pairing candy stripes at the shoulders with a pair of braces that looked more like GT racing stripes later seen on Holden Monaros and Ford Falcons at Bathurst in the 1970s. 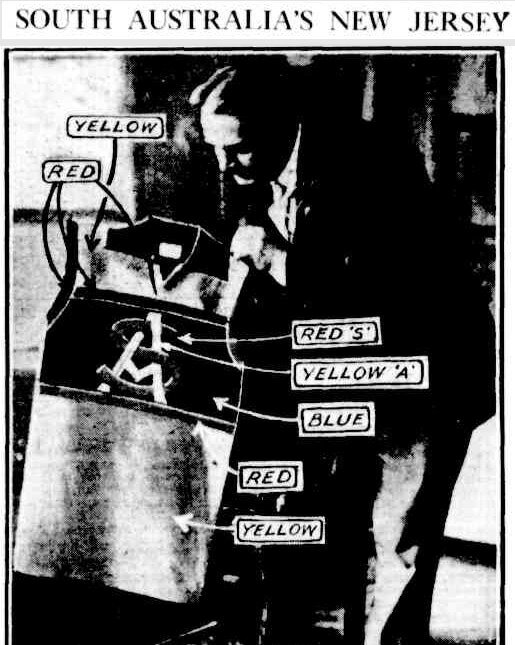 SANFL Secretary, Frank Marlow and a reader named "Athlete" engaged in the 1930s equivalent of a Twitter war, firing shots at each other via the Letters to the Editor section of Adelaide newspaper, the News. Athlete opened proceedings on July 2 (see image at right) with the observation: "Surely it is not necessary to dress footballers in all the colours of the rainbow". Marlow replied in the July 3rd edition, noting that the uniform was composed of the State colours agreed to in 1930 by representatives of football, cricket, bowls, golf, hockey, baseball, lacrosse, swimming and later adopted also by tennis. Then came the counter-punch: "If 'Athlete' can suggest a better combination of the colours I am sure my league will be only too pleased to give same full consideration". Athlete responded on July 8th, offering up the following combination that would not be so "displeasing to the eye": "Why not blue jersey and knickers, red stockings, and the letters S.A. in gold across the chest? Such an outfit would be distinctive and harmonious, and would contrast strongly with the present garish uniform". No samples were forthcoming and the design remained unchanged for the South Australian's return match against Victoria in August. A trend had emerged in South Australian football at this time with all SANFL clubs except Glenelg switching from jumpers to lace-up jackets. After the controversy of 1931 the State team followed the trend and the new design shown above was introduced for the 1932 interstate matches played in June and August. Team and match photos clearly show the new design pictured above, so at some point between that meeting on May 2 and the first interstate match on June 11 this decision was overturned and a new design and lace-up jackets were adopted. Note that in both games some players wore long-sleeved jumpers underneath their sleeveless jackets. For the 1933 National Carnival the South Australians adopted another new design and continued to wear lace-up jackets. This was the first of the red, gold and navy blue uniforms to last more than one season! During this period a handful of players wore long-sleeved jumpers underneath their sleeveless jackets. However, on the July 1934 tour of Western Australia, the unusually cold conditions in Perth resulted in the entire team wearing the long-sleeved jumpers underneath for both matches of the tour. The sub-committee again bypassed simplicity of design in favour of a motley mix of ideas that included gold braces (as previously seen on the failed 1931 design) and a striped collar. The search for a long-lasting South Australian State jumper was destined to continue into 1936. As with previous seasons a handful of players wore long-sleeved jumpers under the official, sleeveless uniform. On June 25, 1936 it was announced in the Adelaide press that the SANFL had chosen yet another design for the South Australian team. This was the sixth design in seven seasons since the new State sporting colours of red, navy blue and gold had been adopted and finally the SANFL had got it right... only they didn't know it. After so many failed designs the league administration continued to second-guess themselves and just two days after releasing details of the 1936 uniform they announced a month-long knitting competition to find a new design! The competition was to be run in conjunction with The Mail newspaper and offered readers the chance to design the future State jumper. One year, when the men took the field in Melbourne, there was a shout of laughter from the crowd, and cries of "Pretty Joey" pursued the players. The 1930s proved a key decade for State football jumpers with Victoria wearing the first version of their classic Big V in 1931, Western Australia wearing their first gold jumpers with a black swan in 1935, and South Australia adopting a red jumper with a navy blue and gold vee in 1936. 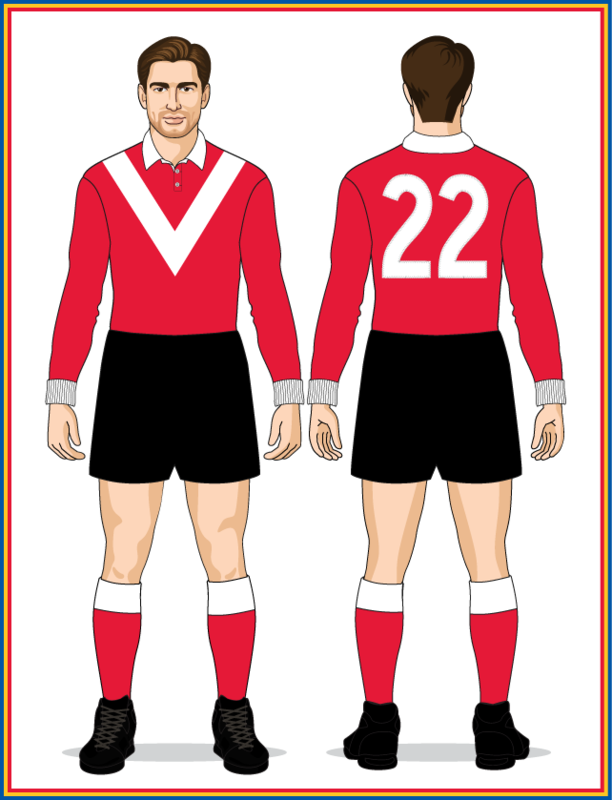 In 1937 a long-sleeved version was added, preventing players from wearing long-sleeved jumpers under the official uniform as had frequently occurred since the first sleeveless jumpers were introduced in 1923. 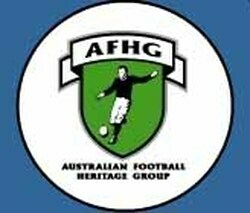 World War II had resulted in no interstate or representative matches for South Australia in 1942-43. Representative football finally resumed in 1944 when a full-strength South Australian line-up faced a Victorian RAAF side made up of top-level VFL players who had enrolled in the Air Force. So this provided the SANFL with the choice of three remaining sets of club jumpers that had been in storage since 1941. Norwood's jumpers were too close to the Victorian RAAF jumpers so the SANFL selected West Adelaide's black and red striped kit (this decision meant the Norwood and West Torrens jumpers were the only ones not seen on-field during the 1941-44 period). Although the war had ended rationing was still in effect when South Australia faced Victoria on July 7 at Adelaide Oval. 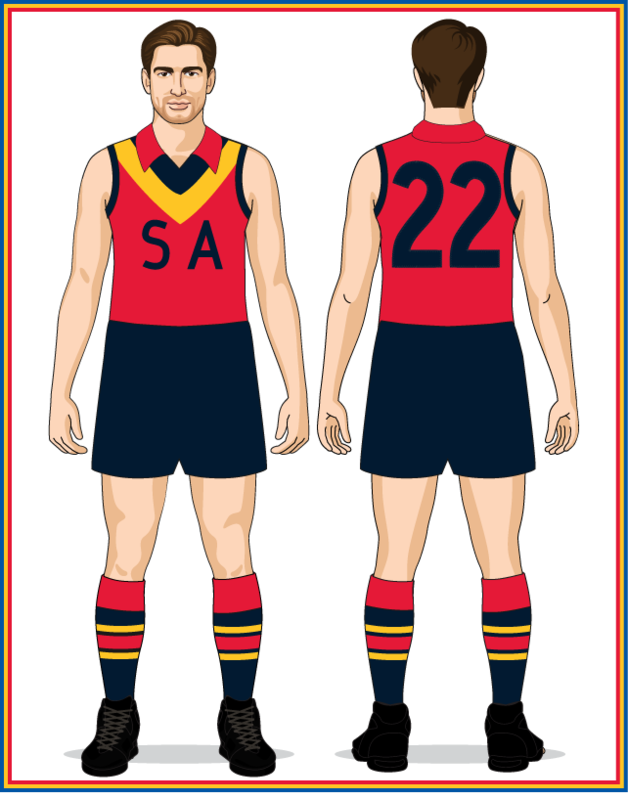 With no possibility of producing new State jumpers, the South Australian side wore a borrowed set of North Adelaide uniforms for the big match instead. The V running from the shoulders to the middle of the jumper clearly impressed the Victorians, as they switched to this style of V on their State jumpers for seasons 1946 and 1947. These two end-of-season exhibition matches were not official representative matches and only featured players from a handful of SANFL clubs. It remains unknown what uniform was worn by these teams.